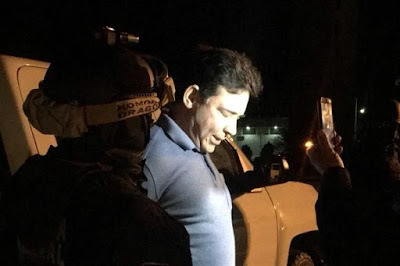 The former governor of Tamaulipas, Eugenio Javier Hernandez Flores, entered Tuesday, around 23:53 hours and under a strong security operation, into the Federal Social Readaptation Center (Cefereso) No. 1, better known as "El Altiplano" ", Located in Almoloya de Juárez, State of Mexico. He arrived by air, after being removed from the Center for Execution of Sanctions (Cedes), Ciudad Victoria, around 20:00 hours. The former governor of Tamaulipas faces federal charges, such as embezzlement and operations with resources of illegal origin, for which he was arrested in October 2017 and now faces an extradition process to the United States. In addition, in a new trial that started last September, the Office of the Special Prosecutor in Combat against Corruption of Tamaulipas, accused him for patrimonial enrichment for an amount close to 50 million pesos. On October 19, a District Judge based in Culiacán, Sinaloa, denied granting protection 788/2018, which the former governor promoted against the request for extradition to the United States, where he is charged with three crimes related to organized crime and money laundering. Earlier, on October 4, the control judge Patricio Lugo Jaramillo, linked the former governor to the process, since he considered that the accusations filed by the Tamaulipas prosecutor's office "were sufficient." During a hearing held on September 28, the state authority told the judge that, based on the investigations, the origin of the former agent's income could not be determined. Eugenio Hernández is requested by the Federal Court of the Southern District of Texas, in the United States, for the crimes of conspiracy to commit bank fraud, operate a money transfer business without a license and illicit association to launder money. However, on March 16, the Mexican Ministry of Foreign Affairs (SRE) considered that it was not appropriate to grant his extradition for the first two charges, but for the last. In addition, the former president and former member of the Institutional Revolutionary Party (PRI), has been in prison since October 6, 2017, when he was arrested in Ciudad Victoria, accused by the Special Prosecutor's Office in the Combat of Corruption of Tamaulipas, the crimes of embezzlement and money laundering. The president, who governed Tamaulipas from 2005 to 2011, is accused of acquiring, according to criminal case 67/2017, by means of prestanombres and at undervalued prices, 1,600 hectares of the port area of ​​Altamira, which belonged to the State's patrimony. In November 2015, the United States seized the former governor $3.8 million dollars in one of its bank accounts in the Inter National Bank, money that supposedly received from his brother-in-law Óscar Gómez Guerra. The Americans began to investigate Hernandez Flores for allegedly operating a scheme to defraud the Inter National Bank, Lone Star Bank and International Bank of Commerce, with the purpose of obtaining funds and credits. If convicted, the US Attorney's Office will ask to seize the former president of Tamil Tijuana three residences in McAllen Texas, valued at $1.8 million dollars, and one in Austin, Texas, with a commercial value of $2.6 million dollars. On October 18, the Attorney General's Office (PGR) completed a provisional arrest warrant for extradition against Hernández Flores, 59 years old, required by the United States justice. He will be in the same prison Chapo is at. The Feds need to investigate those banks aswell for taking the money. I've heard the lone star bank owner is one big crook...and owns half or more of the RGV..
@1:48, the point of having those banks investigated is noted- like the banks in Miami in the 80’s; but the fed is doing double handshakes with the banks, Who got the stimulus money- banks. Even the HSBC investigation led to fines. I have noticed that most of the corrupt politicians are from the PRI party. PRI is infested with criminals. Don't mess with America. Just ask Chapo when the judge hands him life in prison. Genaro García Luna not arrest for his crimes ? Send em all up...florence supermax...we'll keep the light on for ya.. He is just one of many that they need to round up. They should just arrest all of the present and former governors of the various states for the past twenty years, line them up against a wall and shoot them all.